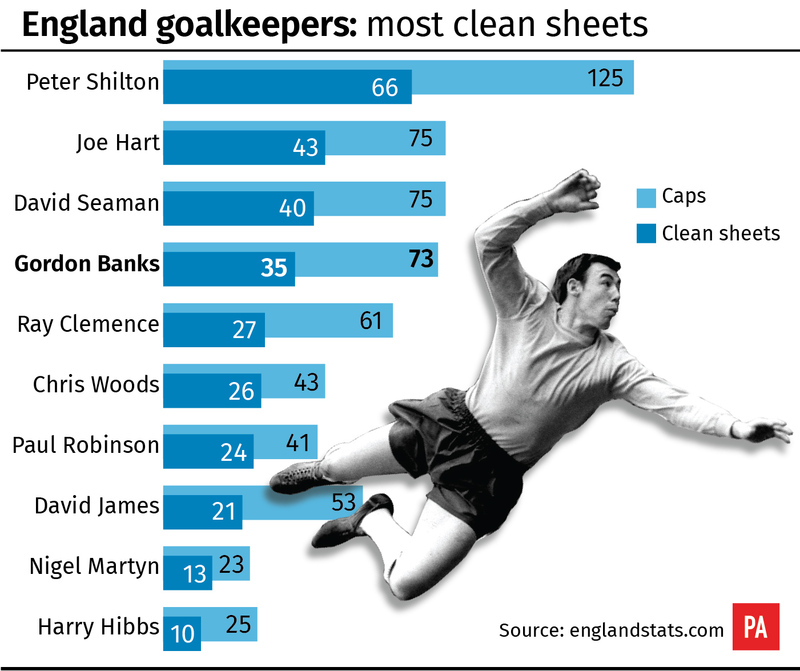 Here, Press Association Sport takes a statistical look at Banks’ England career and how he compares to the other leading keepers in Three Lions history. Banks won 73 caps between April 1963 and May 1972 while with Leicester and Stoke, three quarters of the games England played in that time. He kept 35 clean sheets, one every 2.09 games, which helped him to a record of just 57 goals conceded – 0.78 per game. England won 49 of those games (67 per cent), with 15 draws and just nine losses. Only five different nations beat England with the Yorkshireman in goal – Scotland three times in 10 meetings, West Germany and Brazil twice apiece, and Argentina and Yugoslavia. Banks is England’s fourth most-capped goalkeeper, behind Peter Shilton – whose 125 caps are a record for any Three Lions player – and David Seaman and Joe Hart with 75 apiece. The same trio also rank ahead of him in clean sheets – Shilton with 66, Hart 43 and Seaman 40. Ten goalkeepers in all have managed at least 10 clean sheets for England. His clean sheet ratio is impressive but is surpassed by seven other England keepers, among those who have won at least 10 caps. Those figures are dominated by keepers from the last 30 years, with Chris Woods leading the way ahead of Paul Robinson, Hart, Nigel Martyn, Tim Flowers, Seaman and then Shilton. England’s record with Banks was better than in the other games in his era, with eight clean sheets in the 24 matches he sat out – though Peter Bonetti managed five in seven caps. Banks, of course, can lay claim to something no other England goalkeeper can having played in a World Cup win.